Fort Fido Dog Daycare & Boarding News Blog: Elated Emily! We welcomed a happy-go-lucky new pup to The Fort this morning. Say hello to Emily. 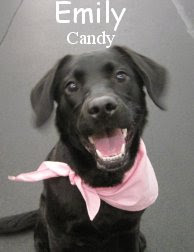 She is a ten month old, forty-seven pound, Black, Labrador Retriever. Emily passed her assessment with flying colors! She came in eager to play and had a very sweet disposition. With a spirited temperament, Emily frolicked in the Medium Roll. She took on all the dogs but especially liked Niko and Chance. Emily played hard, was very social and communicated well with the others in the pack. We are happy to have her and plan on seeing her again soon. Nice job!